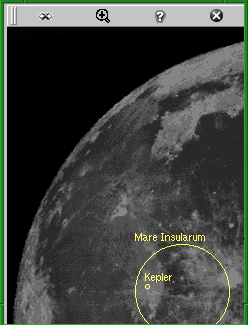 Just Moon (formerly called qmoon) is lunar observing software for Linux, Zaurus, and potentially other platforms. It's free software, open source, licensed under the GPL. It's still very experimental, but it's getting to the point where it's actually useful. It's a bit slow to draw objects, so I'll probably work on speeding it up a bit. Note: you can tap and hold (on the Zaurus) or doubleclick (on a workstation) to get a dialog with a little more information (not much yet). It knows the roughly 2000 lunar features from the official USGS list; it has two zoom levels (full and half) and can mirror left/right. Just Moon is intended to be extremely portable between platforms. Currently it has two front-ends, qt and gtk; the qt front-end can be built as a native linux app or as a Zaurus/Opie Qtopia app, and the gtk front-end runs on Linux and Mac OS X. The screenshot at left is the Zaurus version. then run make installdata as root to install them. 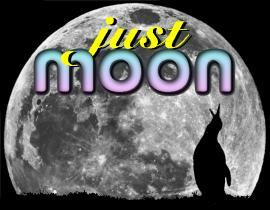 I'll make Just Moon linux binary packages (RPM and deb) eventually -- watch this space (or pester me if you want one sooner). Download a Zaurus/Opie package here (somewhat older version): qmoon_0.2_arm.ipk. The gtk version also runs on Mac OS X, under XFree86. Here's a mac binary, compiled on OS X 10.2.2. You'll need XFree86, gtk+, and gdk-pixbuf, available as fink packages: fink install gdk-pixbuf will get all of it, but it may take quite a while if you don't already have the gnome libraries. In theory, both the gtk and qt versions should run on Windows, but no one with Windows and a compiler has expressed interest in trying. 8/20/2003: 0.3.3 Use /usr/local as the root instead of /opt/qtopia. Minor code cleanup. 11/15/2002: 0.3.2 Fix a crash in qmoon (image wasn't being initialized properly) and rename the directory to justmoon-version. 10/15/2002: 0.3.1 Introduce gmoon, the gtk front end. 10/1/2002: 0.3 Factor front-end and back-end code, and move all the qt code off into a subdirectory, to facilitate (1) smarter makefiles (easier to switch between qt build modes) and (2) alternate front ends (gtk, mac, whatever). 9/25/2002: 0.2.1 Fixed icon handling on the Zaurus; made separate .pro files for tmake/qpe vs. qmake. 9/22/2002: 0.2 Fix (I think!) the mysterious disappearing image problem. Improve image rotations, and tune offsets for zoomed images. 9/8/2002: 0.1.9 Add zoom feature. 9/7/2002: 0.1.8 Shift labels so they're not drawn offscreen; draw mountains and rilles as "X" if we don't know their orientation. 9/6/2002: 0.1.7 Add larger-size image, for running on a workstation. Code cleanup; have objects draw themselves. 9/5/2002: 0.1.6, 0.1.5, 0.1.4, 0.1.2 Add more data types (Rilles, Mountains, etc.) and ways of drawing. I also have some Astronomy Java applets (with Zaurus packages), and some PalmOS astronomy software.